Is Walking Good for Vertigo? Dizziness can be incapacitating, but a walking program can help to alleviate it. Vertigo, or sudden episodes of dizziness, can be very limiting. When you feel as if the room is spinning, you want to remain safe in bed. After a call to your doctor, and during a vertigo-free moment, a walking program can help build up your balance for those times when vertigo unexpectedly arrives. 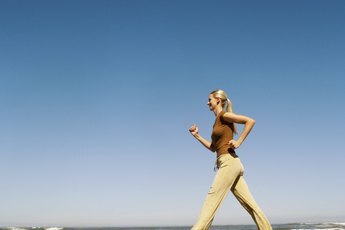 Walking also improves your brain's tolerance to dizziness, as you challenge your vestibular system with the exercise. Vertigo is not only a problem for the aging population. It can strike anyone, at any time. The spinning sensations can be mild to severe, can last for minutes or days, and several theories exist as to the cause. You may experience extreme vertigo due to a severe chronic illness such as Meniere's, which is an inner ear disorder. Any disorder of the inner ear wrecks havoc with the balance system and can cause dizziness. You may also experience slight vertigo with low blood sugar or changes in blood pressure. The vestibular system is the part of your inner ear that helps your body maintain equilibrium. Your brain interprets information sent from the vestibular system so that you know whether you are upright, lying down or spinning. When episodes of vertigo occur, something has gone wrong in the vestibular system. A walking program that uses head movements and balance training will help improve your vestibular system and can lead to a decrease episode of vertigo. Walking when dizzy is a difficult task. You may feel unable to stand, turn your head or take a steady step. It is not recommended to do a walking program when you are in the middle of an episode. You can train your brain to respond better to abnormal movements or stimuli to reduce the severity and frequency of your vertigo episodes. A walking routine is one of the easiest ways to do this. Always walk in an area that is free of clutter and check with your doctor before you begin. Your walking program begins with heel-to-toe walking in a straight line. A hallway is a good place to practice this as you have the support of the walls if your balance falters. When you master walking a straight line, add head rotations to your practice. As you step forward with your left foot, turn your head to the left. As you step with your right foot, turn your head to the right. The head movements strengthen your balance system as it experiences two motions at one time: forward walking and side-to-side turning. Once this is easy to perform, walk across the room as you look side to side, then try walking with your eyes closed. If you experience vertigo during your exercise, rest and then return to the routine once the dizziness passes. When you are able to maintain your balance with your indoor walking exercises, take your routine outside. Attempt the same exercises such as walking in a straight line and walking as you rotate your head. 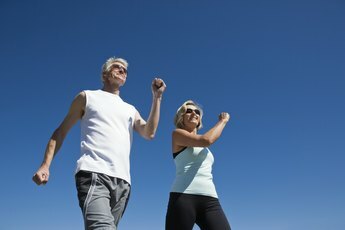 Then, advance to 10 to 20 minutes of walking exercise. Outdoor walking exposes your vestibular system to a variety of stimuli, which further strengthen the way your brain responds to the movements.